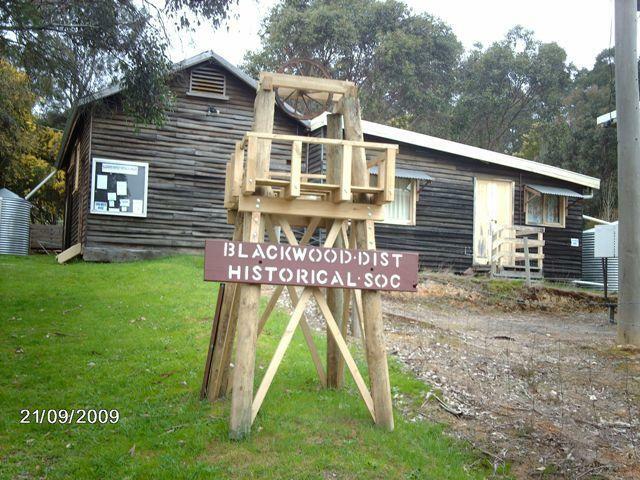 “The Billy Pincombe Tragedy” book was launched at Blackwood in the Historical Society’s Museum on Easter Sunday 2014. 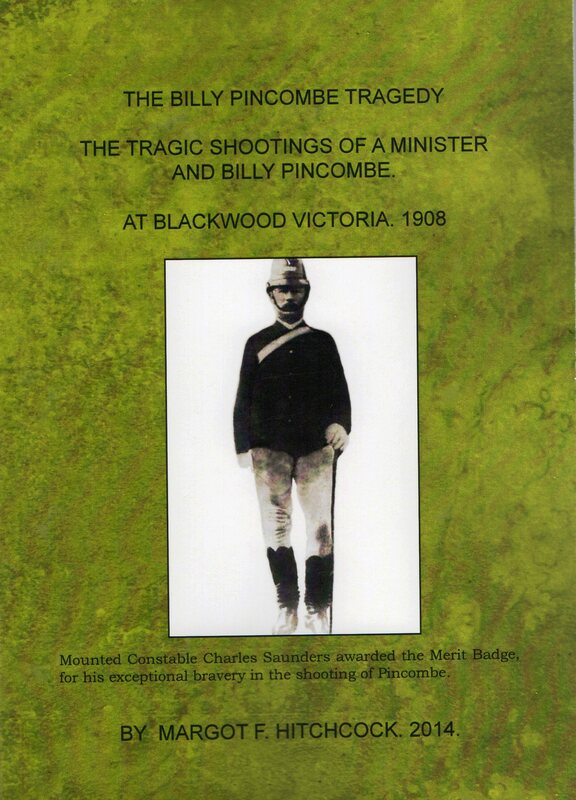 The book ‘The Billy Pincombe Tragedy’ is a true story of Murder, Mania and Madness that happened with the tragic shootings of a minister and Billy Pincombe at Blackwood, Victoria. Historical true crime.The events that lead to the institutionalization of one person for Religious Mania after she chopped off her right hand, and the shooting of two people in Blackwood, over one hundred years ago in 1908. The A5 book has 178 pages with index and 55 photos. The story revolves around Annie May Pincombe formerly Annie May Morrish daughter of William John Morrish and Rachael Louisa Gamble, Annie was born at Dean near Geelong in 1885. Annie had religious mania and cut of her right hand in November 1906. She married Billy (William) Torrington Pincombe in January 1906, and had a son, John William Pincombe in October 1906. Billy Pincombe was a gold miner and the son of John Pincombe, miner and Mary Ridd. Billy was born in Devonshire, England in 1860 and his sister Gertrude Mary Pincombe was born in 1863 after the family arrived in Blackwood, Victoria. Other children born in Blackwood were Ann Pincombe 1864, Henry Torrington Pincombe 1867, and John Ridd Pincombe 1868. Billy Pincombe blamed the local minister, Lay Reader Harold Gamil Robinson for his wife’s Religious Mania which led her to chop off her right hand, so Billy shot and killed the minister. Then the local Constable was called for and Mounted Constable Charles Henry Saunders shot and killed Billy Pincombe in June 1908. Rev. Harold Gamil Robinson was born in Lancashire, England in 1865 and his parents were Thomas Robinson a clergyman and Fanny Smith. Harold Gamil Robinson was married to Harriet Rachel Kenshole in 1890 – she was born 1869 in Scarsdale, Victoria, to parents Samuel John Kenshole and Mary Jane Wilson. Harriet Kenshole was one of 11 children born between 1860 – 1885. Harold and Harriet Robinson had no children. Harold Robinson had eight brothers listed in a death notice living all over the world – Brighton, England; Texas, USA; Oregon, USA; Toronto, Canada, and a sister in the Falkland Islands. Some were ministers and a brother-in-law was a Canon. The book tells the circumstances that led to the murder, madness and mania, and gives details of the Inquest and Asylum records and photos of the houses they lived in and a photo of Annie Pincombe in the Asylum after she cut her hand off. Also photos of gold miners who lived at the time and photos of Blackwood. Records are given of Pincombe, Morrish and Saunders family members and other people involved in the Inquest records. SPECIAL DISCOUNT ORDER PRICE OF $14 (plus $2 postage) TO PEOPLE RELATED TO ANY NAMES MENTIONED ABOVE – AS THIS IS YOUR FAMILY HISTORY. ORDER YOUR AUTOGRAPHED COPY NOW…..LIMITED EDITION – ONLY 500 COPIES PRINTED – $16 plus $2 postage. 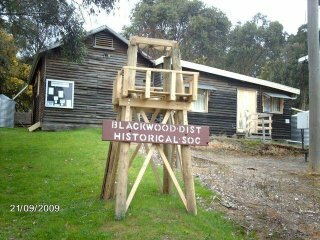 or purchase your book at the Blackwood Historical Society Museum, Greendale to Trentham Road, corner of Warner street, Blackwood. Museum open from 10.30am – 12.30pm on the 1st Saturday of the month. Books available from outlets in Blackwood. ie – Blackwood Post Office and the Garden of St. Erth.